Looking for some good coolers for your next outing? We have researched and reviewed all of the top-rated coolers we could find, looking for all of the best stats and reviews. After an exhaustive search, we came up with our list of top 10 coolers, compiling everything together in a convenient list just for you. To find the best of the best, we reviewed each one, putting together a list of important specs for each of the coolers on this list. Here are some of the things we found important when searching for the perfect cooler. Type: What sort of cooler is it? We’ll let you know if it’s a rolling, standing, bag, or another kind of cooler. We’ll go into more detail in the review. Can Capacity: How many standard, 12-ounce canned drinks can this cooler hold? This will give you a great idea if the cooler is big enough for you. 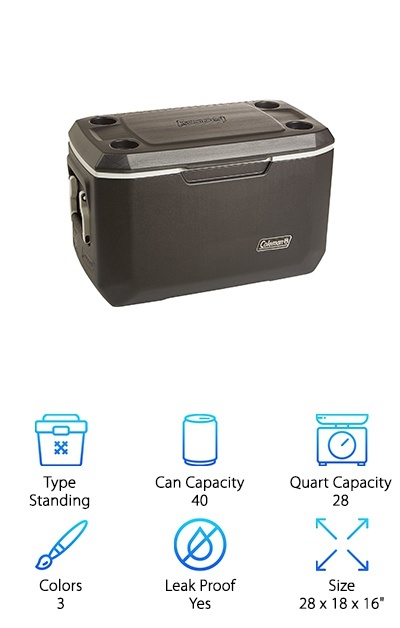 Quart Capacity: How big is the cooler? 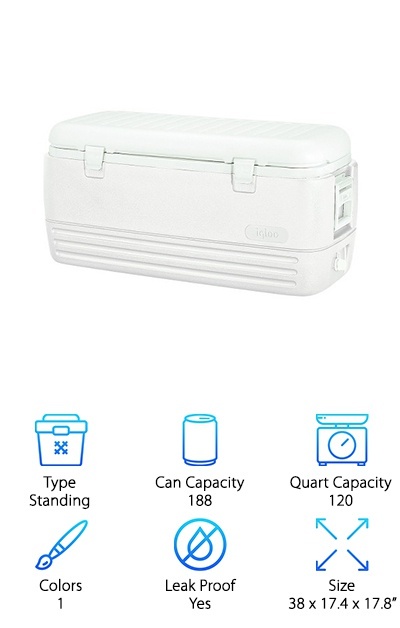 While knowing the number of cans it can hold is helpful, you may wish to also know it’s capacity in quarts. Colors: Coolers usually come in several colors; we’ll let you know the number of colors they each come in with more details in the review. Leak Proof: Is the cooler leak proof? We’ll let you know yes or no here, but we’ll give you a little more information on it in the description. Size: How big or small is the cooler? We’ll give you the measurements for each of them in inches, length by width by height. Now that we have all of the stats out of the way, we’re just about ready for those reviews! We love each and every cooler on this list, so we didn’t put them in any particular order except for the first two. These are special; they are our Top Pick (our number one overall pick) and our Budget Pick (the budget model that blew the rest out of the water). If you are in a hurry, be sure to check those two out first. Now, let’s get to those best cooler reviews! Do you want a cooler that can keep your stuff cool for up to three days in 90-degree weather? Our Top Pick can do it! The Coleman Performance Cooler is the best cooler for camping that we’ve ever seen! This cooler holds up to 63 cans and is tall enough to hold two-liters standing upright. No matter where your camping adventure takes you, you can fit enough food for most weekend trips into the wilderness. The handles make for easy carrying and are designed to fold in and save space, too. The Coleman Performance Cooler comes in two easy-to-spot colors: bright red and bright blue. We love this standing cooler for helping your family to make great memories camping without having to worry about keeping your cold food cold! The CleverMade Collapsible Cooler is one of the best coolers on the market for those who want it all without spending it all! This collapsible cooler is designed to hold up to 50 cans plus ice. It’s made of durable polyester and polyethylene and sealed to make it leak-proof. It has convenient handles to make carrying around is cool-looking cooler a breeze. The CleverMade Collapsible Cooler comes in a variety of color combinations: black, purple and gray, blue and gray, gray and teal, and black and gray. We love this cooler for small camping trips, grocery shopping, or just a wonderful evening out and about. And not only do we think this is one of the best coolers for the money ever, it’s also collapsible to save you a lot of storage space! Need a giant cooler? The Coleman Xtreme Wheeled Cooler is not kidding when it calls itself “Xtreme;” it’s a massive cooler that can hold more than six cases of soda. It’s one of the best coolers with wheels ever designed for big jobs and tons of food, drinks, and ice. This cooler can hold everything you’ll need to keep cold for camping, road tripping, or wherever else life takes you. And its amazing insulation and lid-sealing technology can keep your stuff cold for up to five days in 90-degree weather! Not to mention this thing is eco-friendly. It contains no CFCs, HFCs, or HCFCs. And the top even doubles as a side table with four cup holders to keep your drinks from easily toppling over. There’s a bunch of reasons why we’re pretty sure this is the best cooler with wheels around, and we’re pretty sure you’ll love it too! Need something a little smaller? 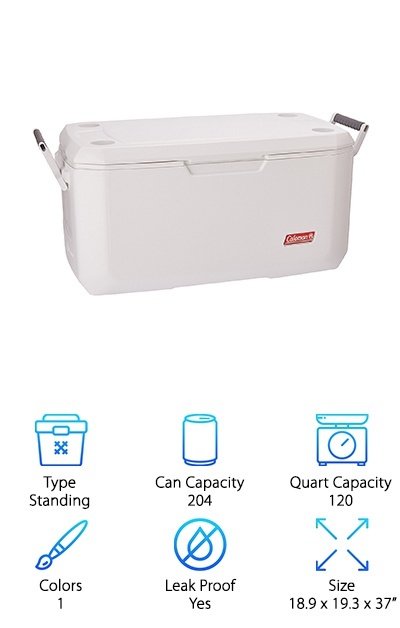 If you are looking for the perfect cooler for your next picnic or even just to bring to work every day, the Rubbermaid Classic Cooler is a great choice. It’s about 10 quarts and is about 10.5 by 13.4 by 9.1 inches. It comes in five colors: yellow, pink, orange, blue, and red. Both had a sturdy, fold-down handle for easy storage and even easier carrying. The outside and the inside are designed to resist stains and are easy to clean, making it perfect for even everyday use. And it helps to keep food cold for hours! Our favorite part is how it is small, but it is still large enough to fit water bottles standing upright. And that makes it the perfect size in our opinion! The Coleman Coastal Marine Cooler is the best beach cooler around! It’s a standing cooler that’s ready for all of your adventures outdoors. The outer coating guards against UV damage to your cooler while the inside is designed to be as easy as possible to clean. Its massive interior can fit up to 204 cans of cola. It can keep ice frozen and food cold for up to six days, even if the temperature outside is around 90 degrees! The secret is in the great seal between the cooler and the super-insulated lid; it keeps things cold much longer than any cooler we’ve ever seen! The drainage system is also insulated and leak-free, making this great for the on-the-go families. The handles are incredibly comfortable and make for easy moving. And the best part? The cooler’s durable lid doubles as a seat for anyone up to 250 pounds! Looking for something with wheels? We love the Igloo Ice Cube Roller for those looking for something that doesn’t need to be carried around! The Ultratherm insulation helps to keep food cold for a long time, protecting everything inside from leaking out. The lid has four convenient cup holders for your family to use while out and about. The telescoping handle is around when you need and disappears into the cooler when you don’t, making it easy to pack into your vehicle so it takes up as little space as possible. Although it only comes in one color, the bright blue of the outside of the cooler is both pretty and practical. But you haven’t even heard the best part! 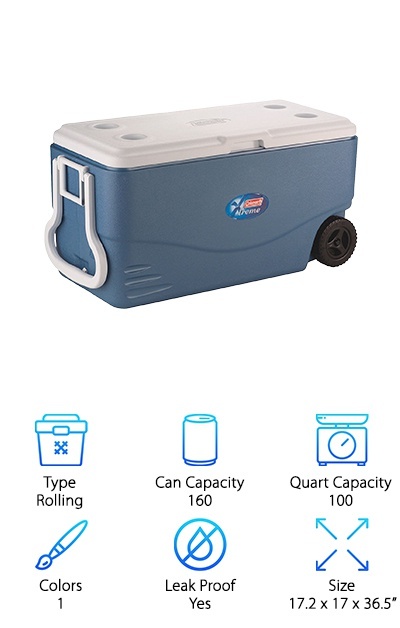 This cooler is super durable; the handle, wheels, and construction are designed to keep going for the long haul! The Coleman Xtreme Cooler is the same model as the Xtreme coolers higher up on our list. 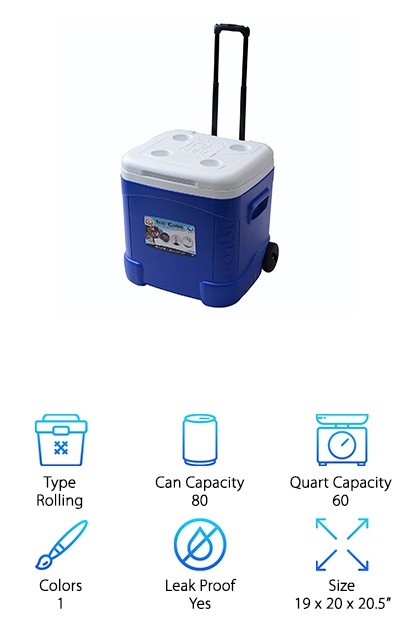 The main differences are that this cooler is a slightly different size and doesn’t have wheels on it. We really loved the Coleman Xtreme series, though, and know it deserved a second spot on this list! These coolers come in a variety of colors, including blue, gray, and gray-black. It has a great seal and incredible insulation that teams up to make an awesome cooler. The comfortable-grip handles fold away so your cooler takes up a little less space. And the best part of these amazing coolers is that you get the security of knowing your cooler was made by an awesome company that is well known for their quality outdoor items! We love Igloo coolers! And the solid white Igloo Polar Cooler is no exception. It can hold ice and keep food cool for up to five days even in scorching, 90-degree weather. 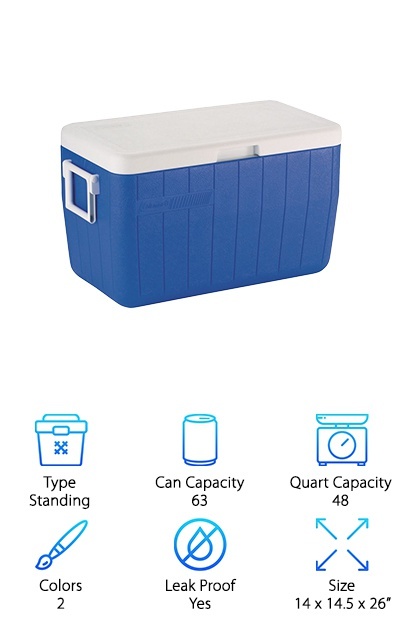 This cooler has swing-up handles that are reinforced to keep them from breaking, even when the cooler is full and heavy. 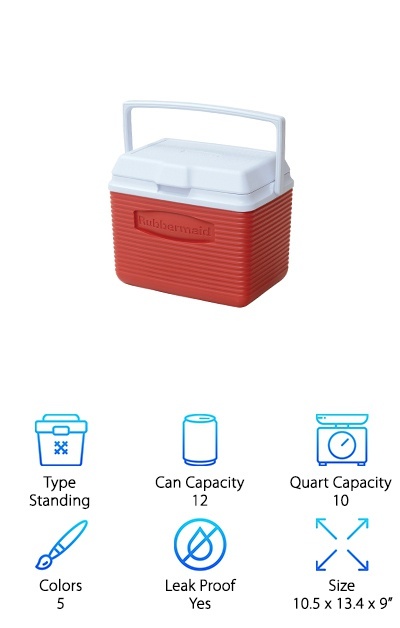 Unlike most of the other coolers on this list, this one actually has two lid locks to ensure the lid stays closed. They have little snap buttons to keep the top securely in place. And this cooler is huge! It’s about 40 by 17 by 18 inches, making it big enough to hold 188 cans of standard sized cola. So if you need a durable, secure, and massive cooler for a great price, check out the Igloo Polar Cooler. We were really impressed by the design, and we think you will be too! 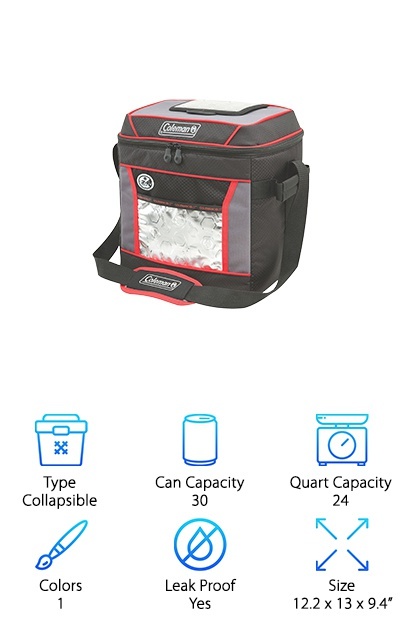 The Coleman 24-Hour Can Cooler is a fabric, collapsible cooler that is still big enough to hold up to 24 quarts. The zippered top overlaps, helping to keep everything inside cold for up to 24 hours. It’s heat-sealed seams help to keep the cold and liquids in while keeping the heat out. The liner is made from an antimicrobial liner that fights hard against odors, mold, mildew, bacteria, and fights stains too. It’s easy to wipe down and keep clean too! It comes with a padded shoulder strap that makes for hands-free carrying. And we love the stop-rip fabric that helps to prevent tears! We think this is the perfect tailgating cooler. It really stands up to the heat and does not disappoint. We’re pretty sure you’re going to love it too! Looking for something to take to work? 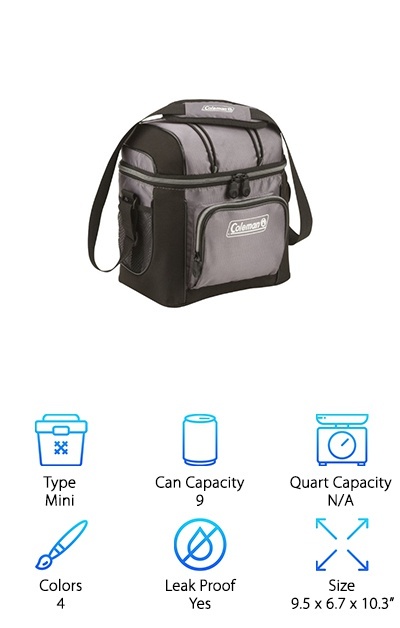 If you want to pack up a lunch, bring along a couple of drinks, or just keep a few things cold, the Coleman Soft Cooler mini collapsible cooler is perfect! 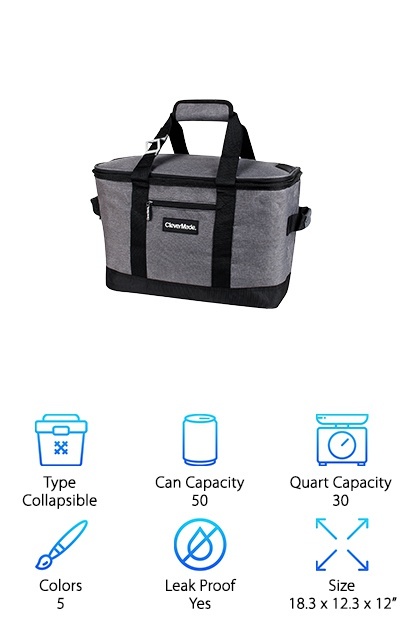 This fabric cooler has a main zippered pouch that holds up to nine cans, and it also features a couple of pockets on the outside for extra storage. It comes with a convenient shoulder strap for easy carrying. You can use either ice or ice packs in this leakproof cooler. The seams are heat-welded to keep everything cool inside and to keep your ice from leaking to the outside. And the best part is that this lightweight cooler fights germs with a sweet antimicrobial lining! This amazing cooler is our favorite cooler for everyday use; it even fits pretty easily in the fridge!